Are you the best Driving School Instructor in Sherwood or Rosalie ? So often parents call on the phone and say "Sam is a great driver but needs some help with reverse parking" or the Learner calls and says "I've done my 100hrs and i'm ready to do my test". Perhaps they genuinely feel they are saying the truth but the reality is some are not great drivers and the 100hrs does not mean you are ready for a test. If you have been a Driver Trainer for a while you will have experienced these comments. Lets assume you have a "Cert 4 in Driving Instruction". Does that make you a great Instructor? is it possible you are just like the Learners above and genuinely feel you are a great Instructor. Do you want to be a great Driver Trainer or is it just a job / a business? If you want to be better at what you do how can you get some personal development. Well that can be very difficult in this Industry. The Driver Trainer School wants to assist Driver Trainers with peer development and will do that at a very nominal cost. 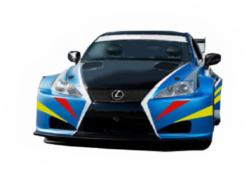 We will assist you with one hour in car personal development sessions where you will essentially self evaluate aspects of your Training skills with our help. There are many aspects of Driver Training that can be improved and we can help you find the areas that you may want to build. Even Driver Trainers can have fun with Learning. If you are interested or want more information, please fill in the Contact Us form and we will give you a call. The "System of Car Control" is an important element in becoming a smooth driver. For a Manual transmission car, there are two very important steps in this system. In the sequence, the driver will brake smoothly approaching a hazard to be at a speed that will be safe to transit the hazard. When an appropriate speed is reached the driver will select the gear that is suitable for that speed in just one step or without selecting any other gears. The driver will then transit the hazard and possibly accelerate away from the hazard. Near Sherwood and Rosalie there are some major roundabouts that learners may have to negotiate in their driving test. So lets consider, what gears we might use to pass through a moderately large roundabout using "The System of Car Control". CASE 1: The Driver approaches the large roundabout in fourth gear and has a clear view and can see no traffic at all from the right of the roundabout. The Driver knows from previous experience that he will be able to safely travel at 30k around this roundabout near Sherwood. Therefore the driver does one gearchange to 3rd gear and continues through the roundabout. CASE 2: Approaching the roundabout in fourth gear the Driver sees a car approaching from the right. the Driver therefore slows a little earlier to a speed of 20k and would thus change directly from 4th to second gear to enter the roundablout. CASE 3: Approaching the roundabout in fourth gear the Driver sees 3 cars directly ahead waiting for traffic on the roundablout. The driver would slow the car in 4th gear and if appropriate stop the car in the queue and select 1st gear. If the other cars in the queue begin to move off before the car is fully stopped and the speed of the car is under 10k per hour, then it would be appropriate to let the car roll and change to 1st gear and progress through the hazard without actually stopping. To be effective in some of these complex roundabout situations at Sherwood and Rosalie, it is best if a good Instructor takes the Learner through some of these scenarios using "The System of Car Control". A good driver will not waist their time with unnecessary gear changes and will be good at analysing traffic situations such as roundabouts. 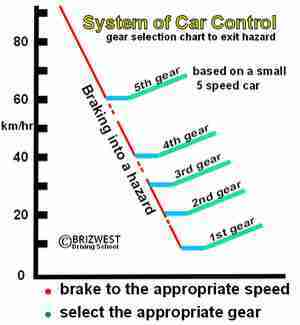 Use the chart shown above as a guide to gear selection when slowing for a hazard. What puts a Brizwest Driving School Instructor way ahead of the field? These are just a few of the characteristics you want in a quality Driver Trainer.